Your little boy will be surrounded by the ABC’s and fascinating animals on this baby quilt, “ABC Animals,” handmade baby boy quilts. The shades of blue and white polka dots and chevrons surround him in 100% cotton baby flannel comfort. A touch of pastel green polka add to this unique embroidered, hand quilted baby quilt for boys. This quilt is hand quilted with love by Sharon, The Baby Quilt Lady. These handmade baby boy quilts are made of 100% cotton baby flannel and are perfect handmade baby shower gift ideas for the new mother-to-be. Homemade baby quilts are both durable and adorable. Perfect for the crib, stroller, or on the floor to use as a play area. All baby quilts are able to be machine washable and dryer safe. All handmade baby quilts for boys are for sale by selecting the “click to purchase” link under each of the following baby quilts and their descriptions. Come and choose one for your new baby or baby shower gift today. 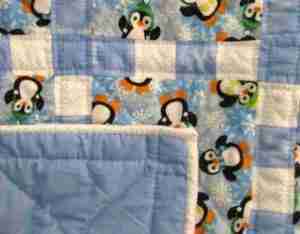 Chilly Penguins in Blue a Handmade Baby Quilt is a beautifully hand quilted baby quilt is made of soft shades of light blues and white features children’s favorite feathered friend from the Antarctic, the penguin. These 8 inch squares, made of 100% cotton baby flannel feature the lovable penguin in the snowy cold, will cuddle your baby and keep them snuggly warm. With a reversible soft baby flannel of a soft solid pastel blue fabric, you will be able to change the quilt by simply flipping it over. Size is 32 x 40 inches. Machine pieced for durability. Binding is hand stitched. Handmade baby boy quilts are designed so that the game of “I Spy” can be an excellent learning opportunity; two identical blocks are sewn into the quilt so that the matching game can also be played, as well as a soft baby quilt for the floor. Backing material is a soft pastel yellow baby flannel. Hand quilted for durability. A soft pastel yellow binding is hand stitched. Machine wash and dry. Quilt size – 36 x 40 inches. Hand quilted with love for your little bundle of joy by Sharon. Take a good look at the t-shirts surrounded by soft 100% cotton baby flannel of yellow pastel stars. This soft, handmade baby boy quilt of pink, yellow, and purple pattern surrounds the many varieties of soft t-shirts to create a wonderful gift.